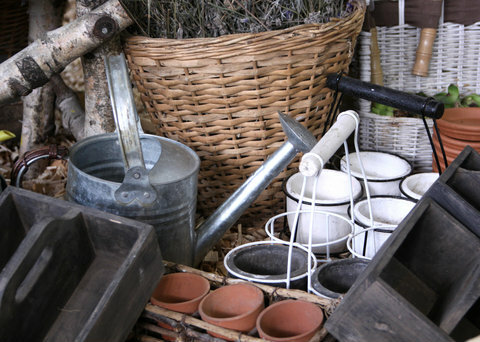 Garden container materials such as wood, clay, metal or stone all have strong associations in the mind of your garden visitors. 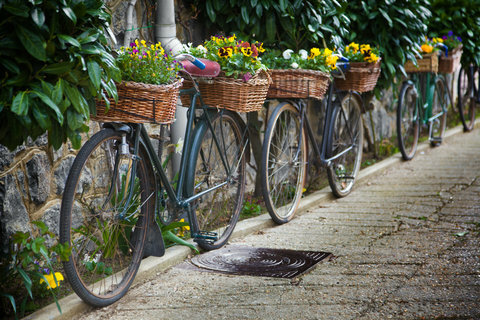 Paying attention to material choices such as these adds richness and variety to your garden design. Don't forget to consider durability of materials and the type of plant you intend to pair with the container as you make choices to extend the life of your design. and diversity of materials never before available. Modern manufacturing and design methods make a tempting array of design choices available. Adaptable to many applications, both formal or informal. 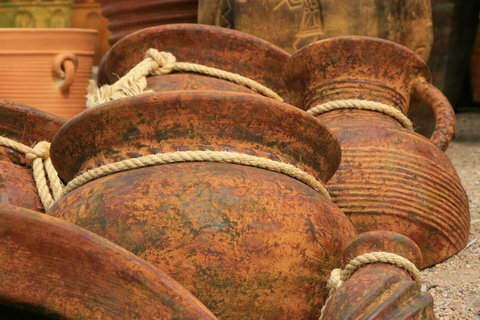 Older pots tend to have more character due to aging and patina. Terra cotta placed in damp areas will begin to collect moss and mildew marks which adds immeasurably to the sense of history in a garden. Terra cotta harmonizes especially well with old brick or stone. Terra cotta is available in almost any conceivable style, so it is easy to match to your garden mood. Terra cotta takes paints well, so provides opportunities to use an unlimited color range. High end, fired terra cotta can last for years in your garden, as it is usually sealed from moisture retention and as hard as stone. Lower end terra cotta pottery can be made to last as well, but will require more preparation, maintenance and care over its lifetime in the form of sealing and resealing annually. 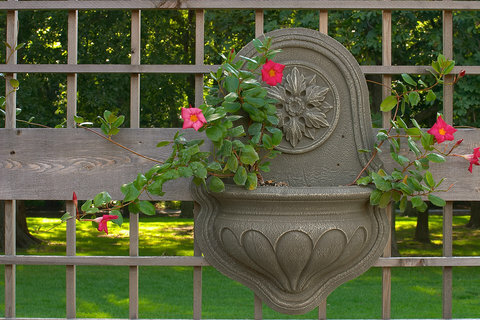 Terra Cotta Urns or Jugs should be planted with annuals as pot bound plantings can destroy the container. As an alternative, place a suitable pot in the mouth of the urn. 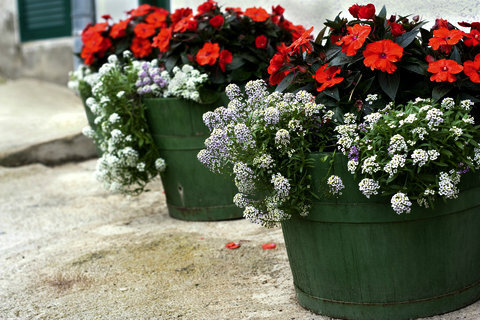 Plants in terra cotta pots require more frequent watering as the terra cotta absorbs water from potting mixes and soils. Typically used in situations where more formal effects are desired, though some glazed pottery can cross over into less formal applications, depending upon size and shape. Some glazed pottery and ceramics will be highly decorated, while others remain simple in shape and form. Glazed pottery and ceramic containers work especially well in complementary or polychromatic color schemes due to their wide range of brilliant colors. High end glazed pottery and ceramics can last for years in your garden as they are more reliably frost proof than lower priced pottery. Glazed pottery benefits from yearly cleaning and regular care. 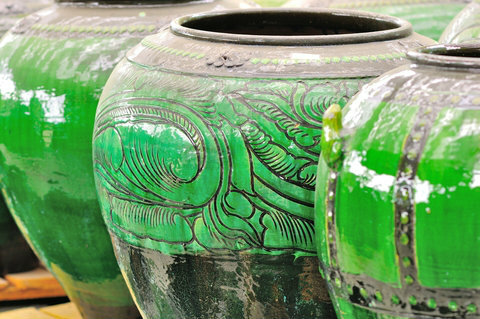 Cracks in glazed pots spell their death, as once the glaze is cracked, water seeps under the glaze and destroys the pot. It is easier to overwater plants in glazed containers, as it will not evaporate through the container as it does in terra cotta pots. Most often used in semi-formal or informal situations. Oiling, staining, or sealing with a product that contains preservatives is generally required prevent rotting. 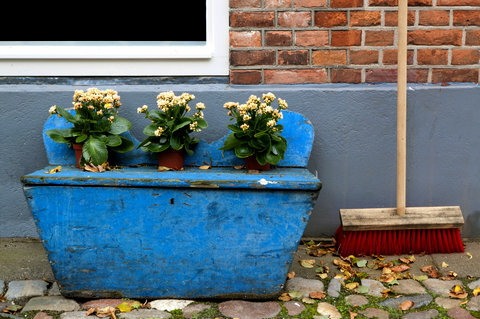 Adding metal or plastic liners can easily extend the life of wooden garden containers. Easily constructed at home with the most basic woodworking skills. 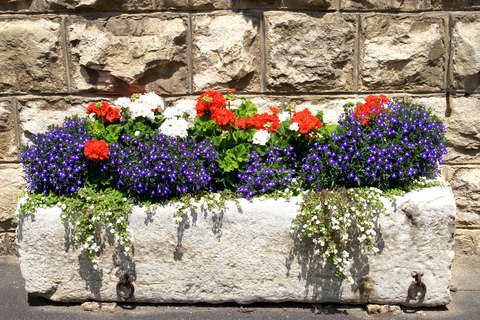 Best used to plant annuals or as camouflage for containers made of longer lasting materials. 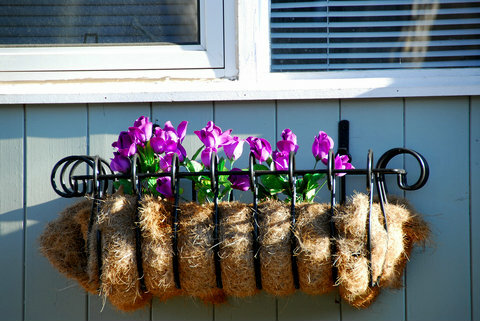 Baskets and woven wood rot quickly and easily if care is not taken to preserve them. Best if used in drier locations, as constant moisture will quickly and easily rot materials. 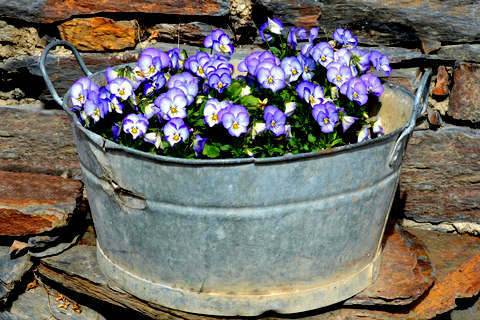 Generally these garden containers will not last more than one or two years in moist climates. Fiberglass and resin containers can be made mimic most other materials easily. Inexpensive fiberglass and resin products may be cheap looking or unconvincing as substitutes for more expensive materials. Fiberglass and resin pots generally do not develop a patina or grow lichens and moss as do stone and clay containers. Tough, lightweight materials create easily cared for garden containers. May fade or lose color over extended periods of time. Broad range of shapes, sizes and styles available, both formal or informal. Cast or molded stones look best in more formal situations, while chiseled or cut stone often adapts better in more informal applications. 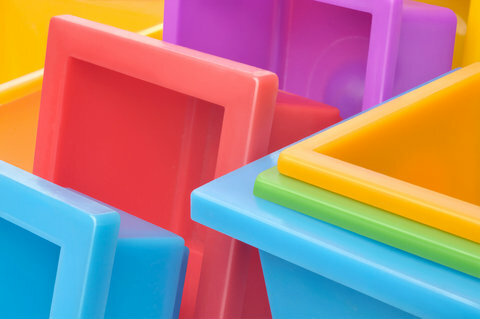 With preparation, plastic containers accept a number of decorative applications, from paint finishes to "faux" finishes such as stone, wood, or metal. May become scuffed or abraded ,creating irreparable damage to aesthetics. The vast array of garden container materials available can be somewhat overwhelming, more so when coupled with decisions about the plantings to add to them. It is worth the effort to chase down the right containers for your new plants however! Nothing beats the right container, with the right plant, in the right place! Material choices are a large part of figuring out that perfect planting combination. And boy does it feel good when it all comes together!